Though it may sound very basic and a matter of no importance to many, stress and anxiety are slow killers which turn people inside out. Stress and anxiety go far beyond than just a few moments of depression. In fact, it is very long lasting and the gnaws at the very existence of the individual who suffers from stress and anxiety. An important question is, why has stress and anxiety become such a common thing today? Well, if we look back at the era of less or almost no technological advancement, we will perhaps find people who were relatively happier and lively than what we are now. Of course, they had their own problems and issues, but they could at least sleep peacefully at night and not be surrounded by a pall of stress and anxiety. So much is the impact of these two diseases that 70 percent of Americans are rendered sleepless. In addition to that, people are losing their self-confidence, becoming depressed and their general mental health is going down. In that light, before we take a look at the 7 ways to fight stress and anxiety, it’s ideal to look into the top reasons that lead to the same, and the symptoms faced by one suffering from stress and anxiety. There can be Nth number of reasons which might cause stress and anxiety amongst individuals. However, work-related stress tops the list of stress triggers as per research. According to this research, 40 percent of workers in the US have complained about stress. Heavy workload and a lot of responsibilities. Whenever we open the news channels these days, we are faced with news of terrorist attacks, bomb blasts, global warming, toxic chemical, and such other negative news. Naturally, such news makes us stressed out since we cannot control these events ourselves. While these are some fear and uncertainties away from home, there are some knocking on the doorstep. For instance, earning enough to keep the family well-fed. Stress and anxiety level for an individual depends on his/her perception of the world and the things around. For instance, if you are to get an appraisal and you start thinking “Oh My God! What if they don’t give me a raise? How will I buy the car? I will never be able to take the vacation!” Such thoughts make it even more stressful. Instead, if you think something like “Let’s see if the boss gives the appraisal, if not I will take up a bit of freelancing as well”. There are some perfectionist individuals who want to do everything in a perfect manner. They feel that no matter what work they take up, it must be flawless. Such individuals suffer from stress and anxiety most of the times. It’s important to note that no one is perfect. We all have flaws and its important for us to come in terms with that. Though change is the only constant thing in life, any major change is stressful for individuals. It doesn’t depend on the kind of event. Be it a happy event like a wedding, or a job promotion or a sad one like losing a loved one or a divorce. All these changing events affect our mental health. Gradually, if we are unable to address the issues in time, we fall prey to stress and anxiety. 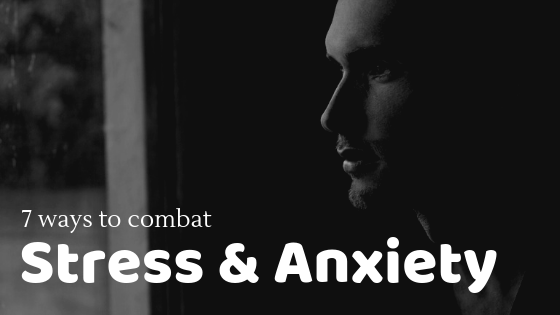 Though both stress and anxiety are severe mental conditions, it can be addressed and cured. But for that to happen, one has to know that he/she is suffering from stress and anxiety. Many a time, it becomes difficult for individuals to realize that they are suffering from stress and anxiety since these two killer disease dress themselves up as daily sadness. Acne is one of the most common signs of stress. Many people have the habit of frequently touching their face when they are stressed out leading to the spread of bacteria on the face from the fingertips. Several pieces of research have linked an acne burst with stress. Headache is a very common symptom of stress and anxiety. Many studies have proved that. In one particular study, it was found that 267 people were suffering from chronic headache due to some stressful event. It also found out that 45 percent of people suffer from headache due to stress. Increased stress level results in chronic aches and body pain. One study on 37 teenagers with sickle cell disease discovered that higher stress level was associated with the increase of pain level in the body. Multiple other studies have proved that an increase in the level of stress hormone, Cortisol, leads to increased pain in the body. A particular study conducted on a group of 16 people suffering from body pain showed a higher level of Cortisol hormone in the body. The test concluded that Cortisol is the reason behind chronic body ache. It has been observed that people suffering from stress fall sick quite often. This happens because stress takes a toll on the immune system and increases the chance of infections. In one particular study, 61 older adults were injected with a flu vaccine. Those who had a weakened immune system due to chronic stress succumbed to the vaccine. This experiment concluded that chronic stress has a negative impact on the immune system. In yet another study, 235 adults were divided into two groups, high and low-stress groups. It was observed that over 6 months, 70 percent of the people in the high-stress group faced respiratory infection and had nearly 61 percent more days of symptoms that people in the low-stress group. Now that the reason behind developing stress and anxiety and its symptoms have been covered, it’s now time to look into the various solutions which can help one reduce stress and anxiety. This is one of the most effective ways to deal with stress. Though it might seem contradictory, putting physical stress on your body, many a time helps in reducing mental stress. You can surely reap the best benefits if you exercise regularly. Over the years multiple pieces of research have suggested the regular exercise is actually better than medication. Not only does regular exercising reduces the stress level in the body but also boosts the self-esteem, confidence level and fitness. But how does exercise help in stress-busting? Stress Hormones: With the help of exercise one can lower the level of Cortisol, the stress hormone in the body. Additionally, exercise helps in releasing Endorphins. This is a type of chemical which helps in improving one’s mood and acts as a natural painkiller. Confidence: One who regularly exercises feels confident and competent. This, in turn, leads to mental well being. Lemon Balm: Lemon balm belongs from the mint family and is believed to be an excellent option for stress relieving. Omega 3 fatty acids: A study found that medical students who received Omega 3 fatty acids had a 20 percent reduction in anxiety syndrome. Green Tea: Green tea has multiple Polyphenol Antioxidants which provide lots of health benefits to the body. Additionally, it lowers the level of stress and anxiety in the body. While these supplements are great, there are many that can interact with the body and have a side effect. Thus it’s important to discuss with the doctor before having such supplements. Many a time, all one needs is the perfect setting and mood to reduce stress and anxiety. In that light, using essential oils or scented candles can help reduce the level of stress and anxiety in the body. There are some essential oils which are especially beneficial for stress reduction. Such oils may include lavender, rose, Bergamot, Frankincense, Neroli and such other. In order for these oils to function to the optimum level, you need an ideal mood. Set dim lights in your room, and use the incense infusor to burn the scented candle or oil. But you need to relax, so get comfortable and breathe slowly. Soon you will be able to smell the aroma of the candle or the essential oils and start to feel relaxed. Using scents to improve one’s mood and reduce stress is called Aromatherapy. Studies have shown that Aromatherapy can also improve the level of sleep. There are multiple studies which have proved that CBD oil plays a role in reducing stress and anxiety. Though many people opt for psychotherapy and medication to treat stress and anxiety, many others opt for the alternative approach and make use of CBD oil to deal with stress. The popularity of CBD oil for stress reduction rests on the fact that it does not have any side effect and has no negative impact on the body. As per a report published by Cannabis and Cannabinoid Research in 2018, around 62 percent of cannabidiol users have said that they have made use of CBD oil to deal with stress, pain, and anxiety with absolutely no side effect! Benefits of CBD oil are not at all limited to handle stress and anxiety. CBD oil also plays big role in curing childhood epilepsy, fighting tough bacteria and much more. One branch of research suggests that CBD oil impacts the endocannabinoid system and also affects the influence receptors which leads to the modulation of the serotonin in the body. It’s important to note that serotonin is a chemical messenger in the body which plays a role in anxiety regulation. While buying CBD oil, look for brands like Vitalibis, as these brands put special care in extracting organic hemp oil using the best extraction process available. Self- Soothing is the key! Whenever faced with problems and difficult situations, our body’s sympathetic nervous system jumps to action. It creates psychological changes. Under such circumstance our breathing quickens, we experience an Adrenaline rush and our heart starts to race. This is the normal reaction of our body to threatening situations. But if the situation is just an imagination, then such responses can be unnecessary and in fact, disturbing. Under such circumstance, practice Diaphragmatic breathing, positive self-talking or listen to music to induce relaxation. “We are what we eat”, this saying fits rightly in this situation because what we eat has an impact on our mental state. For instance, caffeine and alcohol can cause a higher level of stress and anxiety in the body. Even if consumed in a small quantity, studies have revealed that caffeine leads to the rise of panic attacks, nervousness and stress in the body. Caffeine is generally found in food items such as colas, tea, and such other food items. Surprisingly, if one tries to completely eliminate caffeine from the body then it can lead to withdrawal syndromes like shaking, trembling, headaches and restlessness. Similarly, while alcohol is consumed to “fight stress” it actually dehydrates the body which leads to further stress. It’s a well-known fact that visual components have a better effect on an individual than anything else. In that light, it is a good idea to put a few motivational posters in the bedroom. Once such posters are put up, individuals will see it every now and then when they use the room. Subconsciously, the quotes and pictures in the posters will seep in the mind and make one more relaxed. The best part is, one will do it willingly and it will not be a forced affair. Motivational posters can be of stress-busting quotes, a scenery, favorite actor, role model and such. While there are multiple ways to deal with stress and anxiety, it’s important for an individual to avoid situations which leads to stress. Life is full of ups and downs. Just thinking about what might go wrong in life will not solve the problem. So don’t stress over it. Take concrete actions. Stressed And Anxious — Our New Normal?